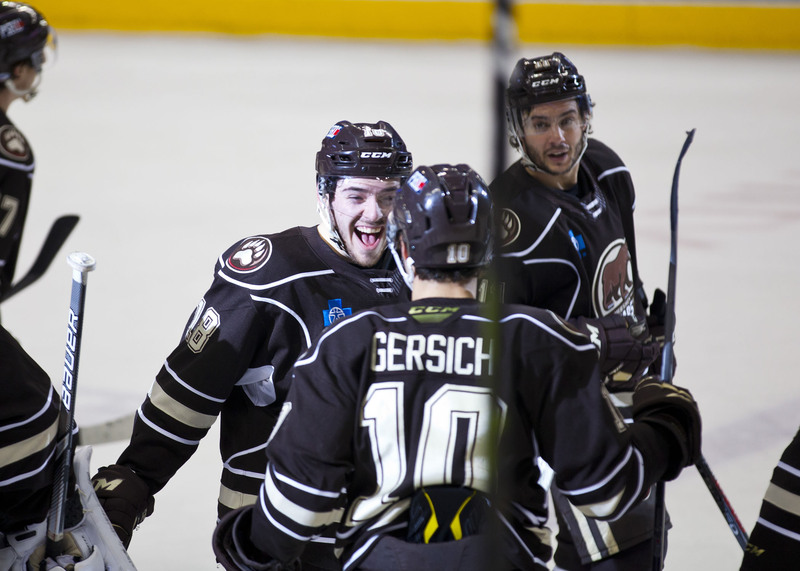 The Hershey Bears beat the Wilkes-Barre/Scranton Penguins 1-0 in overtime Tuesday night at Giant Center in Hershey. The win improves the Bears record to 36-22-3-4 (79 points) on the season. The Bears are now just two points behind the Bridgeport Sound Tigers for second place in the Atlantic Division. The Bears are back in action this Saturday when they visit the Monsters in Cleveland. Puck drop is set for 7:00 PM. Scratches: Kris Bindulis (upper body) was the injury scratch. Colby Williams, Tobias Geisser, Max Kammerer, and Hampus Gustafsson were the healthy scratches. Mason Mitchell was re-assigned to South Carolina on Monday. The first period would go scoreless. The Bears outshot the Penguins 11-4 in the first 20 minutes. The Bears were 0 for 1 and the Penguins 0 for 0 on the power play in the first period. The second period would also go scoreless. The Bears outshot the Penguins 12-7 for the second period, and led 23-11 after 40 minutes of play. The Bears were 0 for 3 and the Penguins 0 for 0 on the power play after two periods. The third period would also go scoreless. The Bears led in shots on goal 15-6 for the final frame, and 39-17 after regulation. The Bears were 0 for 4 and the Penguins 0 for 1 on the power play after three periods. The Bears would win it in overtime with a goal from Garrett Pilon at 1:14 of overtime. Three stars: 1) Garrett Pilon, 2) Tristan Jarry and 3) Vitek Vanecek. The Bears outshot the Penguins 39-17 for the game. Ryan Sproul, Devante Smith-Pelly and Jayson Megna led the Bears in shots with five each. This entry was posted in Hershey Bears, News and tagged Garrett Pilon, Hershey Bears, Jon Sorensen, Wilkes-Barre/Scanton Penguins. Bookmark the permalink.